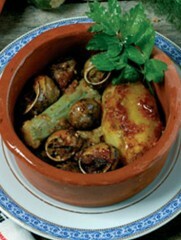 Heat the oil in a skillet and add the snails, ground tomato, parsley, garlic and chopped onion. Season with salt, pepper and saute for 2-3 minutes. Next, add the chopped potatoes and the whole courgettes and let them boil over moderate heat for about 20 minutes. Add some more water during the process, if required. This entry is filed under Snails. You can follow any responses to this entry through the RSS 2.0 feed.